The CSSALT Lab recently mentored two high school students from the Student Science Training Program (SSTP) for a six-week summer program. This is CSSALT’s second year hosting students in the lab. The two students, Gabe Flechas and Eric Thivierge, helped with two ongoing projects. Gabe worked on a project that was started by an SSTP student last year. This project was a multi-touch user interface created to combine with the existing ultrasound trainer. He converted existing CSSALT software to mobile platforms so that participants can now use the ultrasound trainer without the mixed-reality platform hardware. 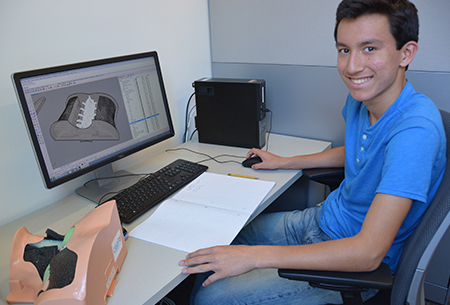 Eric worked on a project developing a Lumbar Regional Anesthesia Simulator. He worked with acute pain faculty members to create specifications for the simulator. 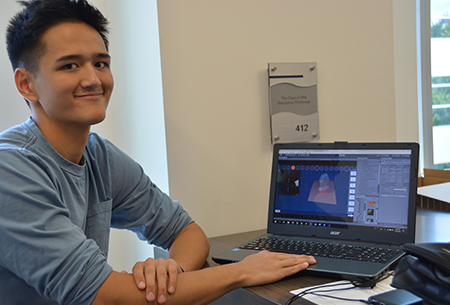 He also created CAD models for the Lumbar Simulator, imported them into Unity, and used CSSALT’s SMARTS (System of Modular Augmented Reality Tracking Simulators) software development kit (SDK) to allow us to re-use our mixed-reality platform. The SSTP students were mentored by Dave Lizdas, Tony DeStephens, Travis Johnson, and Andre Bigos (Undergraduate Student), with Samsun Lampotang supervising.